Yvonne Williams (she is on Etsy as BacktoEarthCreations) likes to create chain maille bezels. Her design is actually a combination of 2 different weaves. I personally love larger rings like the ones she uses. Small ring work just make me cross-eyed! Part 1 is the Half Persian 3-in-1 chain maille weave as a bezel. I've already shared it before but it doesn't hurt to see it again! Especially how she joins the ends together. Glue is used at the back of the cabochon to adhere it to the chain maille bezel. 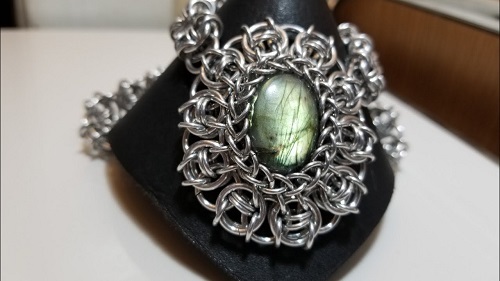 Part 2 shows how to make the outer ring of chain maille. This weave is called Celtic Visions - hence the name of her design. Metal and Mineral shared an image based Celtic Visions tutorial if you prefer that to a video tutorial. The weave uses 2 sizes of jump rings - 18ga 3/16" and 16ga 5/16". Yvonne's tutorial is worth the watch as she shows how to join the weave ends. Part 3 Putting it all together ie joining the Celtic Visions weave to the Half Persian 3-in-1 bezel and then closing the Celtic Visions weave ends. Someone commented on her video, "Closing that chain was clearly witchcraft!﻿"